Despite being a seasoned canvas dweller since being a skinny-legged cub scout, leading school groups on DofE expeditions in areas like Snowdonia and even summiting Mt. Kilimanjaro with the help of tents, taking my own critter (Jesse, aged 1 and a half) away for three nights somehow seemed more challenging…especially to Nat, who has only ever really tolerated camping in all the years we’ve been together if I’m honest. Don’t get me wrong, we have camped as a couple loads of times. It’s just that we’ve most often done it at music festivals and with groups of friends in our pre-children days when the awesome combined effects of alcohol and dancing could more or less ensure a pretty decent night’s sleep. She has always left the muddy, trekking, climbing, tiny tent in -20 conditions, outdoorsy side of camping to me. And sometimes I don’t blame her! So, with that in mind, I considered ways to make camping as comfortable and desirable as possible in order for Nat to be happy and extend my love of it to our (now) kids. After much research on tent types and companies I decided upon a 5m bell tent by Dusky Deer ( www.duskydeer.co.uk – review to follow very shortly). Originally we were going to buy a 4m and then, much to our surprise (fall off your chair level of surprise! ), we found out that Nat was pregnant again (Amelie, now 6 months) so we decided that as a long term investment we needed to up-size. Now first things first, there is no getting away from the sheer size and weight of bell tents, but by the time I’d added festoon lights, beach-style bunting and some lanterns Nat was smitten. Job done! For our first trip we ventured across North Wales to the west coast and Shell Island, situated between Harlech and Barmouth – somewhere we visited fairly frequently prior to the arrival of the critters so a place we knew well enough to find the solace of some of the hidden nooks and crannies well away from other campers. And, after a quick scout, we were well rewarded with a deserted section right behind the dunes, so close to the beach, with its own little sandbar for Jesse to use as a giant sandpit. Nat has often been heard to use the phrase ‘bootcamp’ when we camp. I am assured, however, that this term is used only endearingly in reference to my willingness and enthusiasm for setting up, being camp cook and general camp leader. Ok, I admit, and sometimes for my enthusiasm to get everyone up and enjoying the outdoors nice and early too. But with Nat entertaining Jesse while I setup we had overcome our first worry. Luckily, ‘car camping’ sort of negates this initial potential problem as kids are able to stay in relative comfort until everything is ready even in the worst of weather. 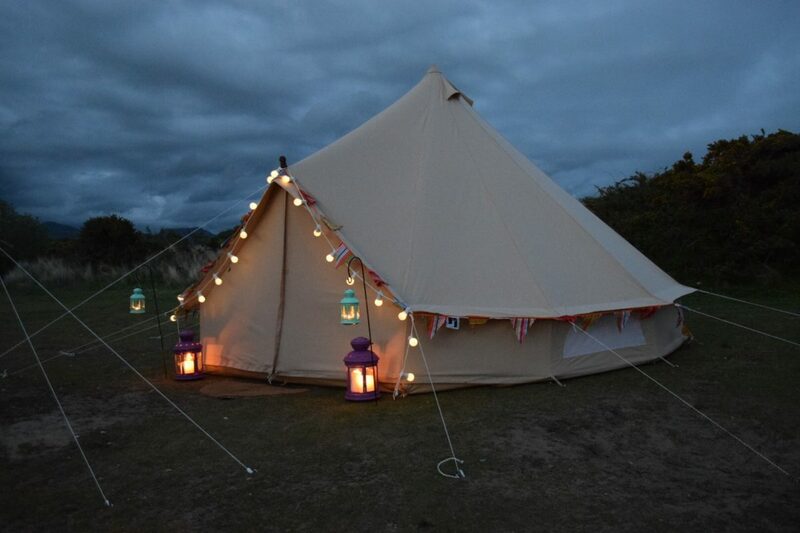 This was further supported by the ease at which you can erect a bell tent. Up and ready in approximately 20 minutes and after speaking to many other bell tent owners, some of whom are single parents, this is a real plus point for family camping. Our first day on Shell Island was spent basking in the beautiful weather that we were afforded, chasing Jesse, watching him roll and roll and roll around in the sand, playing ball and generally enjoying our surroundings. I was also eager to try out my new camp cooking paraphernalia: a fire pit tripod setup and dutch oven pot (review to follow). Long gone seemed my days of reheating dehydrated packets of carbs on cold mountain ledges when we tucked into a freshly made beef chilli that rivalled our home cooked version. Jesse was full and tired from the day’s exertions of being a one year old in the great outdoors hunting ‘biders’ and went to bed like a dream in his goose-down Sleepsac, allowing us to sit outside the tent enjoying the bright night sky and a glass or two of well-earned wine/pregnancy related soft option. Jesse slept with us on a queensize airbed and continued to do this into the summer months when he attended his first music festival (blog post pending) and it just about worked. That said, this summer we’ll be using a travel cot for Amelie and Jesse will have his own folding campbed. However, the most important thing to us was his warmth and comfort, not ours, and that was more than achieved. The next day we took the short drive from Shell Island to Barmouth, enjoyed fish and chips on the coastal path and an ice cream on the beach before heading back to Shell Island as we were being joined for the evening by friends who were driving down that afternoon. They also have a little one (6 month older than Jesse) so the two of them played and played in our perfectly enclosed but deserted surroundings until they could, well… play no more. We cooked a delicious curry from scratch in the dutch oven and then used the fire pit to keep us warm into the evening as we chatted, laughed, shared stories and drank more wine (or pregnacy induced soft drinks for Nat). This is why I was so eager for this trip to work. Because if it’s done well, with the right equipment and environment, camping can be truly brilliant. Liberating even. And now I had successfully hooked the wife and, more importantly, the boy! I would heartily recommend Shell Island to fellow family campers ever wanting to get over to the Welsh coast. The beauty of it to us personally is its sheer size which can, if you look hard enough, result in a pitch far removed from everyone else. Of course this meant that we were approximately a 20 minute walk from the facilities which are basic but certainly good and clean (note: they have since undergone a significant renovation of the shower and baby changing rooms and if the website photos are anything to go by they look very good indeed for a campsite). Other families may balk at this but there are pitches right next to the shower and toilet block, but with them you can also guarantee lots and lots of company. And when you’re too distracted overhearing somebody else’s conversation to continue your own the sense of escapism is somewhat lost. However, there is definitely something for everyone at Shell Island and if the weather turns you can always take your car the very short drive to the shower block and reduce the time to get there to approximately 2 minutes. There is also a small shop on site that sells all of the basics that you could want, including logs to emphasise their raised fire site policy. And, above all, they are located on one of the nicest stretches of welsh coastline with direct access to the beach. We’re already planning a return visit in the coming months. This time with two critters in tow.